We currently have a 517 sq ft office available on the first floor, comprised of three small inner offices, and an open plan area. Rent: £6,307.40 per annum, or £1,576.85 per quarter. We also have a large 743 sq ft open plan office available on the first floor. Rent: £9,064.60 per annum, or £2,266.15 per quarter. Additional service charges will be issued at the same time as the rent, based on the percentage of the area occupied by the tenants. Our building has full facilities for disabled people – a ramped entrance, lift to the first floor, and accessible toilets. 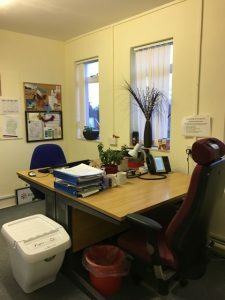 There is ample free car parking, meeting rooms available for hire, and both offices have access to shared toilets and kitchen space. For further information or to come and have a look, please contact Julie on 01380 871007. Our Open Day on the 4th July was a huge success. We’d like to say a huge thank you to all the stand holders, visitors, and performers for helping to make it a fantastic day. Visit our Facebook page to see all the photos and videos. It’s nearly time for our Open Day! 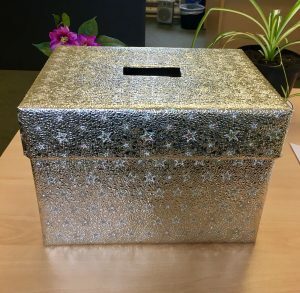 Come and join us on the 4th July 10:30am – 2:30pm – we’ve got lots of information stands, entertainment, and a raffle with fantastic prizes! See here for full details. We are delighted to share the news that Michelle Donelan MP is now a patron of the ILC. Michelle has always been an active supporter of local charities, and we’re thrilled to have her on board. For further details please see the Wiltshire Times article here, or to book an appointment with us please phone 01380 871007. Our Occupational Therapist Christine is running the Devizes Half Marathon on Sunday 9th April to raise money for us at the ILC. If you’d like to sponsor her, please follow the link below, and for a limited time only all donations received will be matched by Localgiving and their match fund campaign! 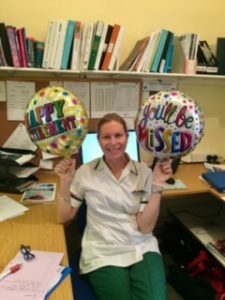 Today we said goodbye and good luck to our Occupational Therapist Janey, as she left for retirement. We look forward to hearing the stories of all her adventures! The Independent Living Centre had an Annual General Meeting on the 25th October 2016. Kevin Reed of the Wiltshire Air Ambulance gave an interesting talk on the history of the Air Ambulance, and their plans to relocate to Semington. This was followed by tours of the ILC provided by Janey Hillier OT, and Lindsay Pearce OTA. We are very pleased to announce that we have installed a new accessible toilet at the entrance. 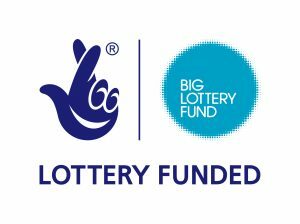 This was made possible with grant funding from The Big Lottery Fund. The Independent Living Centre had an Annual General Meeting on the 27th October 2015. Professor Nigel Harris gave a very interesting presentation regarding the use of technology for people with memory problems and the key challenges ongoing. This was followed by tours of the ILC provided by Janey Hillier OT, and Lindsay Pearce OTA. 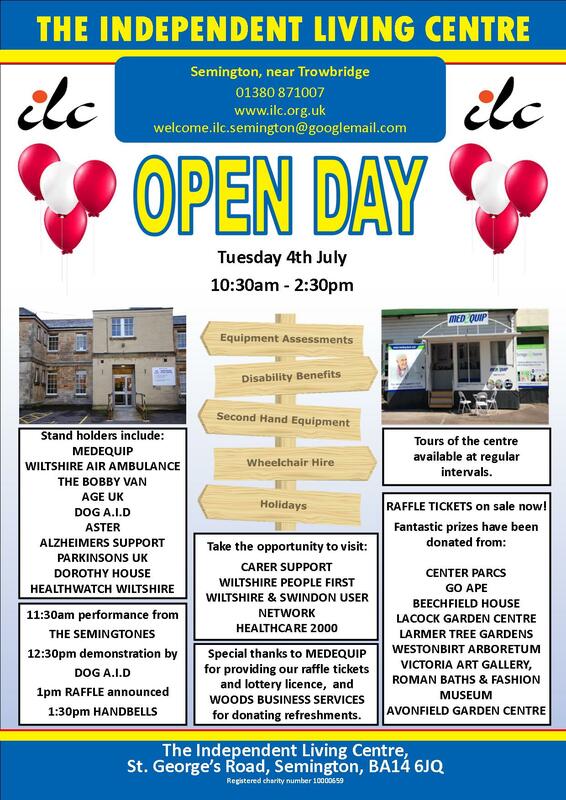 The Independent Living Centre held a very successful Open Day on Friday 3rd June. 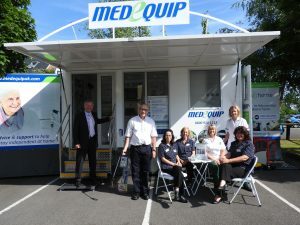 At the event we had a number of stall holders, including Medequip with their new Exhibition van, Alzheimer’s Support, The Stroke Association, The Bobby Van, Dorothy House, Selwood Housing, Aster Living, M.S. Wessex, Somerset Care, Wiltshire & Swindon User Network, Wiltshire People 1st, Carers Support Wiltshire and Parkinson’s UK. 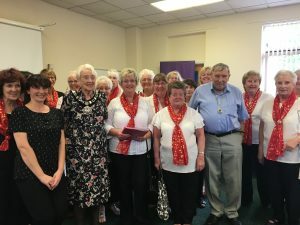 We also had a seated Zumba class from Zumba Gold, back and shoulder massages from The Red Cross, and an example of an exercise class for the older generation from Age UK.